From time to time, we receive requests to add fields into ACT! that really should be tracked in an accounting system. We always explain that ACT! is for your sales and contact management, and Quickbooks, Peachtree, or any other accounting package should be used to track receivables or COGS. Generally speaking, each program serves a very specific purpose – one for tracking Contacts, the other for tracking numbers. That distinction is a consulting issue we like to make clear, but there is value to sales seeing some accounting data. Wouldn’t it be helpful if a sales rep could see that a customer has an outstanding invoice before they sell the next deal? There are some great ACT! add-on products that allow accounting insight right within ACT!. One is a product by Effective Solutions, QBSalesData for ACT!. QBSales Data is what we use internally. It allows us to create new QuickBooks Customers directly from Contacts in ACT!. This saves us a ton of typing and double entry, and it virtually automates adding new customers to QuickBooks. 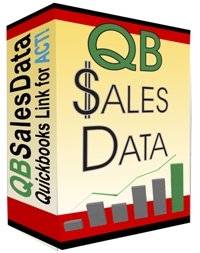 QBSalesData creates custom fields in ACT!. These fields pull communicate with QuickBooks to pull in the Current balance, Current Year Sales and a host of other accounting information. The great thing about this product is that the data is stored in ACT!. That means that accounting information now syncs out to your remote users and is available via ACT! Premium for Web. There are a ton of other features included in the product. You can see a product video here. QBSales Data is $159/user, and users you want to have access to your QuickBooks data need licenses. Call (866) 303-0276 to get a demo of the QBSalesData product or to order your license. And, be sure to tell them TrilogyCRM sent you. If it doesn’t fit I want a button for that!